Yes, it has been two whole years since I started documenting my love of food on this blog. When this blog began, my son was just 2 months old and I used to find time to blog at night, between his bedtime and his 2 am wakeup call for a nappy change or feed. Now, I write when he naps or when he is in school. And sometimes when he is playing by himself in his playroom- and if I get up to do something, I hope to God he does not press publish or delete the page in its entirety. In these two years, my son has grown, little by little; the blog has grown, little by little; but I can safely say that my confidence in the kitchen, especially baking, has grown immensely. And my love for everything butter, sugar and flour has grown ten-fold. This new-found love of baking…it’s not even that first date kind of fizziness that seems fleeting. I really do love the whole process of baking. Measuring out ingredients and placing them in order; taking out the mixer and the whisk and spatula from the cupboard; pausing to take a quick picture before the cake is popped in the oven. I even like the wait while the cake is in the oven. I like how the smell of vanilla and chocolate silently weaves its way out of the kitchen and into the living room. Obviously, to celebrate turning 2, I had to bake. I initially thought I’d make Nigella’s chocolate cherry cupcakes; but I realized I didn’t have cherry preserves or the time to step out and buy a jar. 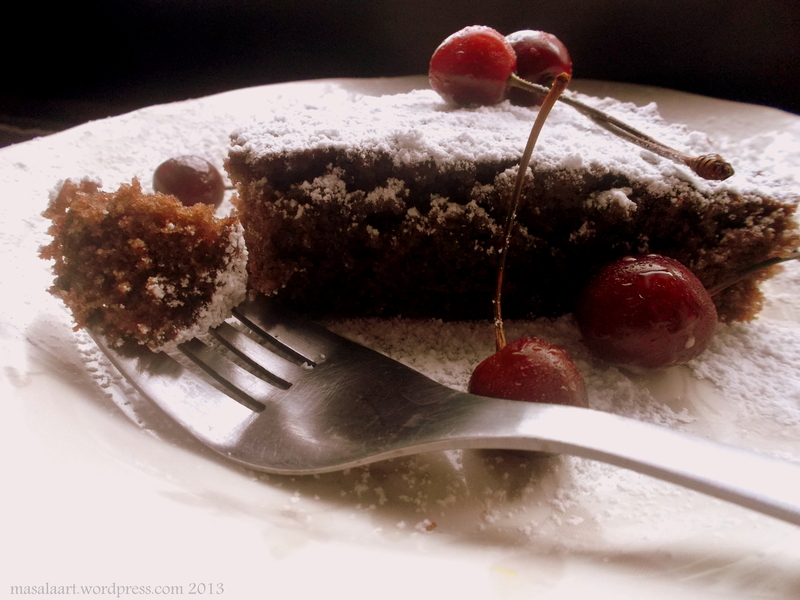 So I toyed around and came up with a chocolate cake with a brownie-like quality to it, and placed some cherries on top for a birthday effect. This cake is moist and buttery enough to stand on it’s own sans frosting; but if you want to dress it up with butttercream or rich chocolate ganache or slather it with some cherry preserves, be my guest. I just went home-style and finished with powdered sugar. The basic cake recipe is simple enough; just cream the butter and sugar, add the eggs and combine the dry ingredients and milk. The melted chocolate added at the end helps give that brownie-like consistency and the thin crunchy chocolate skin on top. Melt your chocolate in a bowl using the double boiler method and set aside to cool a bit. Sift together the flour, cocoa powder and baking powder in a bowl and set aside. In a large bowl, cream the sugar and butter together until light and fluffy. Next, add the eggs one at a time, whisking well after each addition. Now it’s time to add the flour mixture and the milk. Add the flour and milk alternately, whisking after each addition, and be sure to start and end with flour. Once everything is combined, fold in the melted (and now cooled) chocolate. Pour into a greased baking dish and bake at 180 C for 40 minutes or until a toothpick inserted comes out clean. 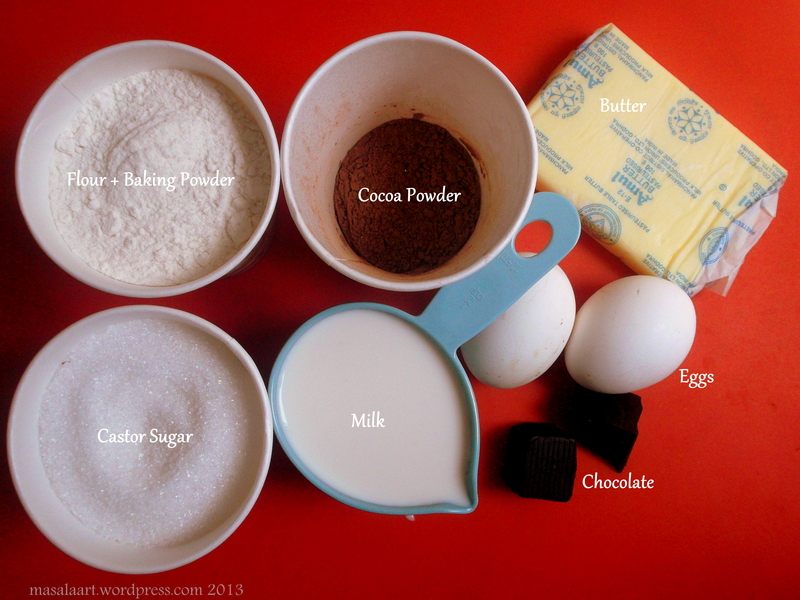 ♥ Measuring out ingredients beforehand is the only way to bake well and bake without fuss. ♥ Using an electronic scale makes life much easier. ♥ A spoonful of cream goes a long way in making buttercream frosting even more delicious! ♥ Eggless baking can yield some pretty fantastic results- and you do not always have to use condensed milk, either. 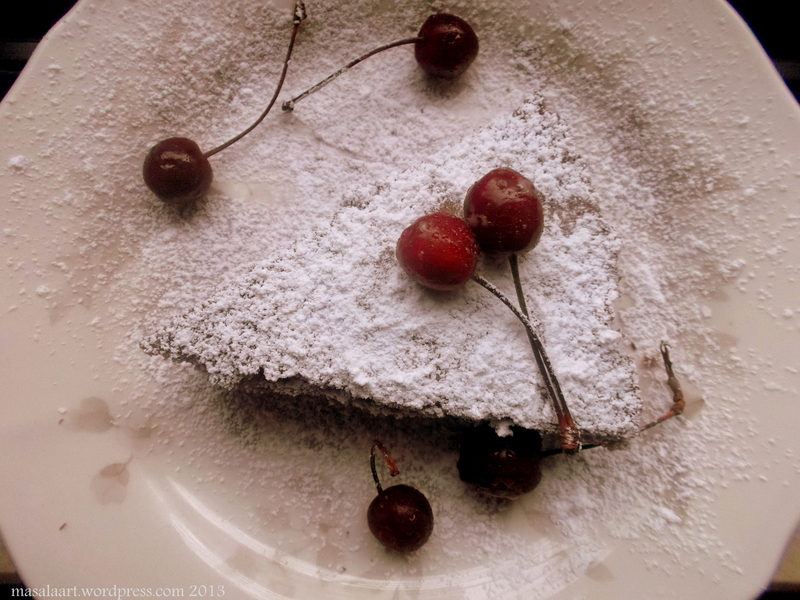 ♥ Folding in the flour gently and treating your batter with love will always give you a beautiful fluffy cake. This year was a little ping-pongy in terms of posting. There were some months where I made myself scarce and did not find the time, inclination or inspiration to create anything. But I realized something else- you can’t just sit around waiting for a eureka moment. You keep yourself engaged and you will find things that inspire you and give you the urge to create and share. Another thing I realized is that the blogging community is filled with wonderful people who are encouraging and supportive and fun. I am lucky to have befriended some really amazing women who share their food, travels, family life and other everyday experiences- and I look forward to coming here each day, to find out what everyone is up to and to see what’s going on in their lives and their kitchens. In the year ahead, I hope to make more blogger friends, share more with the ones I have made, and hopefully meet some of you in person too!! Just stumbled about your blog. Very nice recipes and beautiful pictures. Love the essential baking tips. Daniela thanks so much for visiting and commenting! You flatter me 🙂 You are quite the baker and cook extraordinaire yourself- loved your apricot mini cakes. And I did not know there was such a thing as purple corn!! 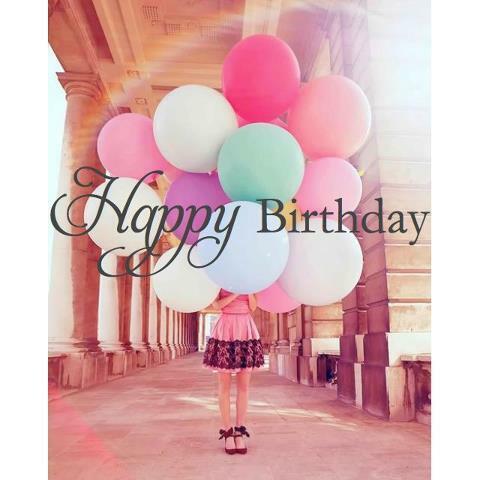 Obviously I am late to the party but happy happy Blogiversary!!!!! Sugar Dish Me will be 2 in September– can’t believe it! You are awesome, girl. Keep on keepin on. Wow……. Meenakshi. Two years ! Time does fly by, doesn’t it. It has been a real pleasure keeping up with your blog. I like the recipes – easy to follow and uncomplicated; and your style of writing is so good! Fun to read, and a wry sense of humour. I enjoy your blog very much. And it has been delightful seeing the way you and your son are bonding. He is a lucky child. That’s for sure. Keep baking, keep sharing. And keep on writing. A very happy anniversary! I have been one of those “quiet” readers; just relishing your writing, both style and content. And watching a young mother, and a novice at cooking find her steps, slowly but surely. Keep blogging, knowing that there are quiet ones like me out there waiting for the next one…. A very happy anniversary M! I am lucky to have witnessed MasalaArt’s journey right from the start – it has been an absolute delight. Be it your recipes, commentaries or photos – love ’em all. Thanks for taking your readers on this adventure with you. And all the best for the next leg of this journey! Prerna- thanks so much for the beautiful words. It really means a lot to me! When friends take the trouble to read the little details, it really gives you that push to experiment and create more. Thank you, thank you!! Awww thanks Uru! Next goal is a layer cake- like that Victoria sponge in your post-exam blogpost!! Happy Anniversary! And what a lovely cake to celebrate with.